For two dozen years, I have used a “strength building” illustration as step one to discuss how training is not always a good solution to performance improvement problems. It is the old Bob Mager, “If you put a gun to their head, can they do it?” kind of framework in that it separates a skillset from a motivation. Simply put, if people can do the job, they don’t need more training to do the job. Training is a good thing if skills are deficient, but we often see new people demonstrate the skills as they are coached but then not demonstrate those same skills over time. Something else is happening and workplace systems and processes are often a good place to look for new Best Practices and ideas to improve motivation and teamwork. So, while training is a GOOD thing, and often one of those reinforcers for workplace performance, it is not THE solution most of the time. My suggestion is to step back from the wagon and change perspective. Ask people for ideas and listen to issues and opportunities. That is the nature of The Square Wheels Project. So, here is a little ditty poem about those issues and opportunities. I hope you like it! Note that training WILL often generate a 2 or 3% improvement in performance since the wagon pushers WILL be a little stronger! A Round Wheel Happy New Year! We had a Christmas Day brunch at one of the finer hotels here in Greenville and, to put it simply, things did not roll very smoothly. There were any number of service quality issues from beginning to end, starting with a “10 minute wait” that was 35 minutes (we sat outside where it was nice and not in the stuffy crowded lobby) to the food quality / timeliness issues to having our table swept when we went back to the buffet (even the silverware and glassware and I had to re-serve our water because there was no one there…) and to having to wait 20 minutes to get the check. Giving specific feedback to the restaurant manager generated a nice conversation with the General Manager /Partner of the property. I expected nothing and was simply sharing information, but he sent me an email a bit ago inviting me to another event. It was both unexpected and unnecessary — maybe we will followup and do it. But getting something for free was not part of my effort to share information to enable better performance. Anyway, I wanted to cheer things up a little and since the Square Wheels image was something he and I discussed, I thought to do up a Happy New Year Poster. 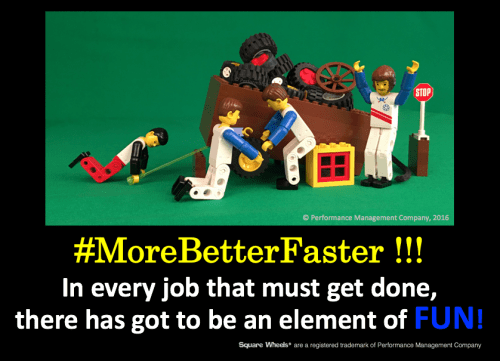 The key point is that people know what they could choose to do differently or #morebetterfaster if they simply had a better sense of why it is important. It does not take much effort for a team of people to implement better solutions and improve how things work. The idea of stepping back from the wagon (and also ignoring the Spectator Sheep) is important to get the overall perspective to find and implement some new ideas. 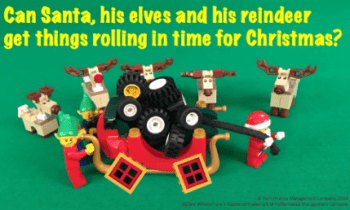 A special Holidays greeting to you with the hope that an illustrated “Getting Santa Rolling” poem might add a touch of fun to your days. Things look too bumpy for Santa, his Elves and Reindeer! How they’ll get flying with those Square Wheels isn’t clear. As solutions exist there that’ll keep it from draggin’. Their ideas for how things could work better there. Engagement and motivation leading them to innovate! into how to implement to make things quite right. Knowing their Round Wheel ideas got Santa in the skies! 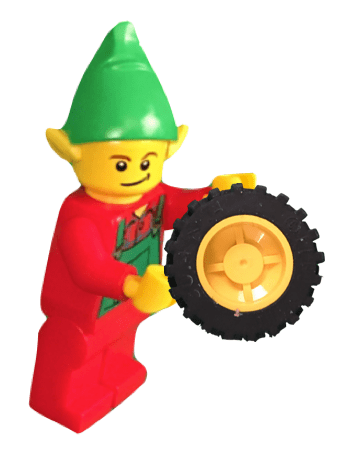 But the Round Wheels are reachable—ab-so-lute-ly! Offer everyone involved a gift of empowerment! “Getting Santa Rolling” aligns with our mission to support Supervisors, Managers and Leaders with simple tools for facilitating improvements leading to a happier and better workplace. Anyway, I thought that we had production down to what was a science. Simple set up, hit some light switches and get out the iPhone, with auto upload to the cloud and downloading to my computers. Neat! But there were small problems. In some shots where we had wider images, like with Santa and the reindeer plus some elves at the back, we were getting the sides of the screen to come into view at the back. That resulted in me having to move LEGO more toward the back to control the angles and image quality. My own Square Wheels metaphor winds up whacking me in the side of the head. A better solution has been there for MONTHS, but I simply could not SEE it because I was used to the way it was working, Neither Chris nor Joan saw it either, and Chris helped me with all the initial set up and has taken half the pictures. The Round Wheels are already in the wagon. Improvement often just requires us to stop, step back, and LOOK for ideas to make things better, rather than simply doing the same thing over and over and somehow expecting better results. I do TRY to live my own metaphor and look for those Round Wheels. Nothing made sense, and neither did everything else. It is not possible to awaken someone who is pretending to be asleep. Caterpillars can fly, if they just lighten up. Thus, be the caterpillar or the butterfly, but always watch out for the birds and expect changes because we go through cycles of existence. If you can’t be kind to others, at least have the decency to be vague. Indecision is a key to flexibility. A decision made is an opportunity for flexibility missed. Thus, flexibility is a key to indecision. Keep thy airspeed up, lest the earth come from below and smite thee. Strive to keep the number of successful landings made equal to the number of take-offs you’ve made. If you lend someone $20, and never see that person again, it was probably worth it. And borrow money from pessimists, since they do not expect you to pay it back. Some managers choose to be rock solid in their commitment to flexibility. Some drink from the fountain of knowledge, others just gargle. The term “devil’s advocate” comes from the Roman Catholic church. When 20 of the church’s most important convene in deciding if someone should be sainted, a devil’s advocate is always appointed to give an alternative view. Management in some companies reminds me of 5,000 ants on a log floating down the river with each ant pretending they are steering and that they know where they are going. But it is not their fault, it is simply the result of their perceptions about how things work. Check out The Square Wheels Project, our LMS for teaching Square Wheels facilitation skills to supervisors and managers. The key point here is that removing Square Wheels has widespread, natural systemic reinforcing impacts for improving organizational results. It is a direct and simple way to impact results, everywhere. Feedback is all about alignment and engagement, since it focuses on giving people the information they need to be high performers. It focuses on best practices and things that can be improved with focus. We see a LOT of this in many of the gamification approaches to accelerated learning and training in general. 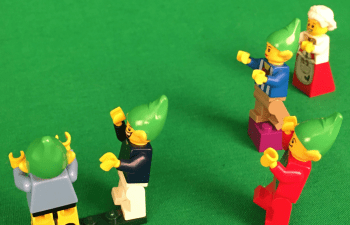 In reading an excellent whitepaper on gamification in general, there was some confusion in using the term “negative reinforcement” that I thought might be useful for a blog, since it does share some different enlightening information. I even did an illustration that anchors it and shows why it would have a positive impact. Negative reinforcement is commonly used as an alternative phrase meaning punishment. Positive reinforcement works when some behavior occurs and it results in a positive outcome or response, positive from the viewpoint of the individual or the team. Positive reinforcement increases the likelihood of that behavior occurring in the future. Punishment works when some behavior occurs and a negative outcome or response occurs. Punishment reduces the likelihood of that behavior occurring in the future. It is a negative outcome. Negative reinforcement works when some behavior occurs and it results in the removal of some aversive stimulus of some kind. The removal, contingent on the behavior, causes an INCREASE in the behavior. It is a positive outcome. There are a lot of issues involved in any stimulus / response situations. There are intrinsic rewards and extrinsic rewards and contingent and non-contingent rewards and a whole lot of “past experience” operating to determine impacts. Perceived (non-actual) links between stimulus and response can generate superstitious behaviors (article here) such as blowing on dice or wearing lucky hats. Intrinsic rewards are personal to people while extrinsic ones (like money) are added and can generate all sorts of unpredicted impacts. (more on extrinsic rewards here and here ). Candidly, I do NOT like extrinsic rewards, since most set up competition and generate both winners as well as losers. Many people (as many as 40%) have also learned that they never win, so why even try. You get to go #morebetterfaster. It’s about Perspective Opportunity, People! Or some such thing. Stepping back from the wagon to look for opportunities is such a more effective strategy than putting one’s head down and bemoaning all the things that are wrong. What you see is all there is. So why not choose to look at things differently and go #morebetterfaster? Our Square Wheels Project is designed to generate those ideas for workplace improvement from the wagon pushers. It is about facilitating different perspective ideas about issues and opportunities. The reality is that both Square Wheels® and Round Wheels already exist. Square Wheels are exceptionally common, a daily occurrence actually, since so many systems and processes simply do not work well — but so few people seem to understand that things can be fixed and improved. Few things out there seem to work smoothly and continually and continuous continuous improvement is an organizational reality. But people also resist change when they believe things are working. The Square Wheels Project is our course focused on improving the facilitation skills and engagement competencies of managers. All sorts of statistics point to this as an organizational issue worldwide, to the reality that engagement is awful in many places, and the the issues that motivation and innovation are critical to long term success. But it is NOT just about identifying problems. It is about implementing solutions and that is often impossibly hard without the active support of the people doing the job. Performance Management Company has been supporting workplace issues of people and performance since 1984. We offer simple teambuilding tools and the Square Wheels® themed tools for engagement and change management, to keep things straightforward and simple. Okay, than it must be sales or engineering or manufacturing or something, right? Well maybe… But let me make the simple point that workers work and managers manage and who has the biggest impact on the workers working? Let me suggest that it is our lowly supervisor. And what is their normal day like? Mostly, from our conversations and observations, they are covered up with obligations about summarizing results, solving problems, doing HR paperwork, dealing with angry customers or angry managers in other departments and, above all, attending meetings! You can save them a lot of time by reducing meetings, or making them more effective and efficient and sending them information instead of telling them. And you can also impact them positively by giving them some job-skills with broad impacts. And you cannot expect them to impact their people much if you do not allow them to interact with their people. (I read an article that showed that people working remotely had more manager contact than those located in the same office space.) And I believe that. Managing by Wandering Around is just not the norm these days, for sure. I’ve been playing with the themes of Square Wheels® for over 20 years and they are a fabulous as well as easy to use way to involve and engage people in workplace improvement. What we have done with The Square Wheels Project is design an online training program to teach the techniques and share the tools. Gallup just published a report that showed that only 35% of male managers in the US are engaged in their jobs. Let me repeat that — only 1/3 of males who are managing and leading other people are themselves engaged. (It is better for women, and it also shows that the teams working under women are also more engaged). But WHAT IS THIS ABOUT? I mean, it does flow downhill and all that but is this even remotely acceptable? NO, in my belief system. How can those employees even be remotely satisfied if 2 of 3 managers don’t care? Today’s reality is that “this guy” is seen as a successful manager of people and a “good businessman.” The reality is meaningless; this is the perception and the model for leadership in the minds of many people. WHY is work not fun? HOW can we shift the thinking of supervisors AWAY from “managing” — aka manipulating — and get them to be more involving and engaging? How can we generate more RESPECT among people working together, thoughtfully, on shared goals and missions? The TRUTH must be out there somewhere. The TRUST that we need for good working conditions can be developed. And we should be adding some FUN to how things work, not some gun. 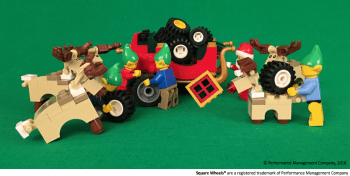 So, a little poem and the suggestion that you check out The Square Wheels Project, a stupidly simple training and development program focused on facilitating more asking and listening in any workplace. 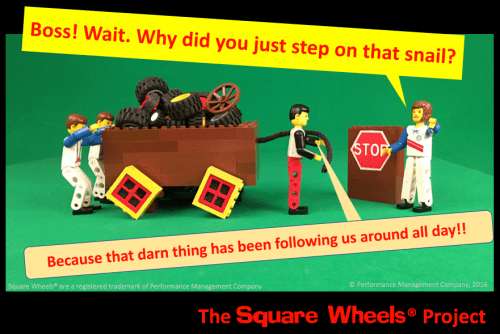 My personal goal is to leave a legacy with my Square Wheels® images and approach to involvement and create a learning space for managers to become more engaged in their own workplace improvement practices. The Manager IS the Motivator — who else can involve their people? 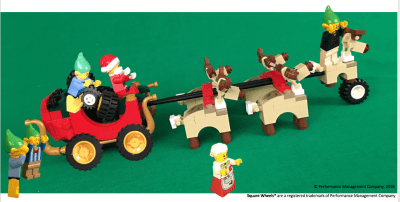 Engagement and Involvement: What Would Santa Do? Engagimentation! 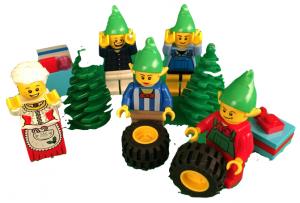 I thought you might like this little story about Santa and the Elves and his reindeer and how he put together some teams to improve motivation and innovation. Santa wasn’t so jolly upon finding his Sleigh not ready for its Big Day! his Reindeers’ concern about his Sleigh; the work it needed. And it was at that exact moment that Santa became mightily irked! This lack of teamwork had Santa feeling stumped! He needed a way to get them collaborating and pumped. and played Dutchman with energy, competition and beams! gave them less ‘Gold’ than if collaborating had been their feat. to fixing Santa’s Sleigh as they talked about what they’d learned. What Santa did and needs to continue to do is Engagimentation. This is the process of engaging people with their ideas for improvement and then working with them to implement those same ideas. An inexpensive Square WheelsToolkit is available.